Newly-formed Irish lifting services company BCS Crane Hire Ltd has added a 60t Liebherr LTM 1055-3.2 and a 200t LTM 1200-5.1 crane to its fleet. 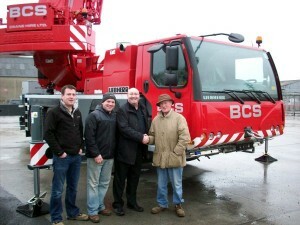 BCS (Bill Cussen and Sons) recently set up operations in Limerick, Southern Ireland, following a management split at Cussen & Co Crane Hire which has seen the Cussen family pull out and set up on their own. BCS said the addition of the cranes to its existing 90t LTM 1090-4.1 would help it to offer customers a comprehensive crane hire service.